Library bag. Tech case. Hedgehogs on bicycles. Project bag. Hedgies. Green tote bag. Reversible dress and bloomers set. Flower delivery bicycles reverses to pick and cream floral. Color Your Own Zipper Pouch Makeup Bag, flowers and butterflies. Get ready for compliments when you bring this bag along on your next library trip! 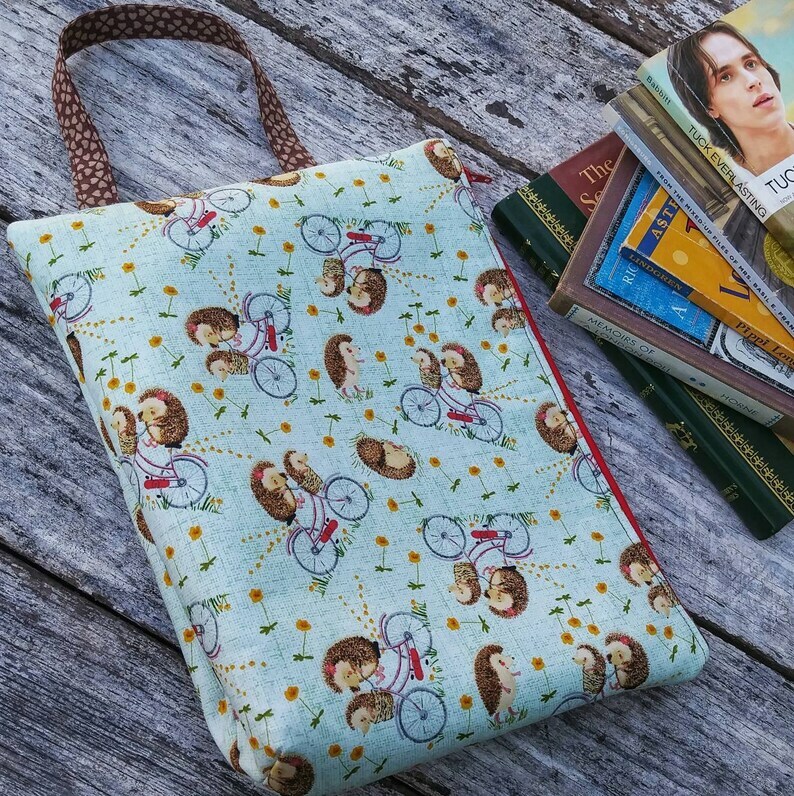 With a built in pocket on the inside for your library card, you can tote your books home in style. Or maybe you're picturing your tablet or knitting project inside this bag and ready to take along with you. The bag is lightly padded making it great as a little tech case. (The tablet pictured with the case is an eight inch tablet just for size reference.) The inside is fully lined with the brown heart print that the handle is made from. Body measurements are approximately 9x12 inches. A card sized pocket is on the inside of the bag. As shown in the photos, the bag will hold several books easily. The bag closes up along the side with a happy red zipper.